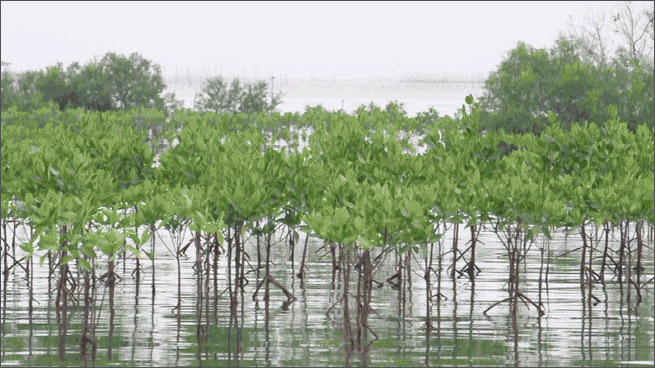 Mangrove forests like the one shown here protect shorelines from damaging storms. These trees are a great example of a natural system that can help communities better protect themselves from natural disasters. According to the guide, the goal of resilient landscape planning and design is to retrofit communities to recover more quickly from extreme events, now and in the future. The guide is organized around disruptive events that communities now experience: drought, extreme heat, fire, flooding and landslides. Biodiversity loss is an underlying threat also explored. The guide includes hundreds of case studies and resources demonstrating multi-benefit systems as well as small-scale solutions. It also explains landscape architects’ role in the planning and design teams helping to make communities more resilient. Risk Reduction. As events become more frequent and intense due to climate change, communities must adapt and redevelop to reduce potential risks and improve ecological and human health. It's also time to stop putting communities and infrastructure in high-risk places. And communities must reduce sprawl, which further exacerbates the risks. Scalability and Diversity. Resilient landscape planning and design offer a multi-layered system of protection, with diverse, scalable elements, any one of which can fail safely in the event of a catastrophe. Multiple Co-Benefits. Resilient landscape design solutions offers multiple benefits at once. For example, designed coastal buffers can also provide wildlife habitat and recreation opportunities; urban forests made up of diverse species clean the air while reducing the urban heat island effect; and green infrastructure designed to control flooding also provides needed community space and creates jobs. In an era when disasters can cause traditional, built systems to fail, adaptive, multi-layered systems can maintain their vital functions and are often more cost-effective and practical solutions. In an age of rising waters and temperatures and diminishing budgets, the best defenses are adaptive, like nature. The Resilient Design Guide has been strengthened through the expert guidance of Alexander Felson, ASLA, assistant professor, School of Forestry & Environmental Studies and Yale School of Architecture; Kristina Hill, Affiliate ASLA, associate professor of landscape architecture and environmental planning and urban design, University of California at Berkeley; Nina-Marie Lister, Hon. ASLA, graduate program director and associate professor, Ryerson University School of Urban and Regional Planning; Nate Wooten, Associate ASLA, landscape designer, OLIN; and Kongjian Yu, FASLA, founder and dean, Peking University College of Architecture and Landscape.